It took me a while to get past the title and into the substance of this book. The use of ‘treating’ and ‘their’, especially in relation to spirituality, suggests such an outmoded paradigm, placing the clinician as someone doing something ‘to’ the patient. There’s not a lot about mental and physical needs. The emphasis is on the spiritual, and it might have been simpler to title the book accordingly. The editor suggests there is no definition of spirituality. Actually there are rather a lot, which is part of the problem. He has gathered together 11 opinion pieces from different healthcare professionals apart from his own. The range of professions included is helpful. While the stories can be interesting and informative, most lack supporting evidence that would assist those who want to argue the case for the integration of spirituality into healthcare. 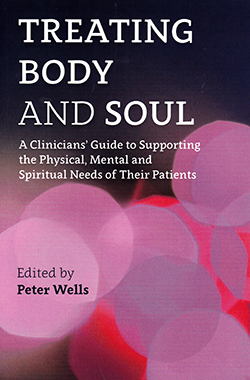 Each chapter illuminates how the contributor is feeling their way into a contentious subject and is as much about their own story and the significance of ‘being human’ as any proposals for patient care.